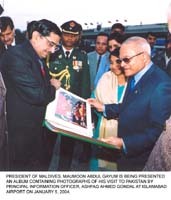 PRESIDENT OF MALDIVES, MAUMOON ABDUL GAYUM IS BEING PRESENTED AN ALBUM CONTAINING PHOTOGRAPHS OF HIS VISIT TO PAKISTAN BY PRINCIPAL INFORMATION OFFICER, ASHFAQ AHMED GONDAL AT ISLAMABAD AIRPORT ON JANUARY 5, 2004. A SENIOR OFFICER OF THE PRESS INFORMATION DEPARTMENT PRESENTING AN ALBUM REGARDING THE SAARC SUMMIT TO THE PRIME MINISTER OF THE NEPAL AT HER DEPARTURE AT ISLAMABAD AIRPORT ON JAN 6, 2004. 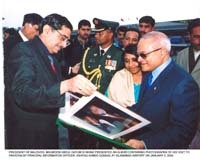 A SENIOR OFFICER OF THE PRESS INFORMATION DEPARTMENT PRESENTING AN ALBUM REGARDING THE SAARC SUMMIT TO THE PRIME MINISTER OF THE BANGLADESH AT HER DEPARTURE AT ISLAMABAD AIRPORT ON JAN 6, 2004.